Around the circumference of action-MMORPG TERA‘s tree-like E3 2011 booth were a dozen or so demo kiosks opened to all attendees. 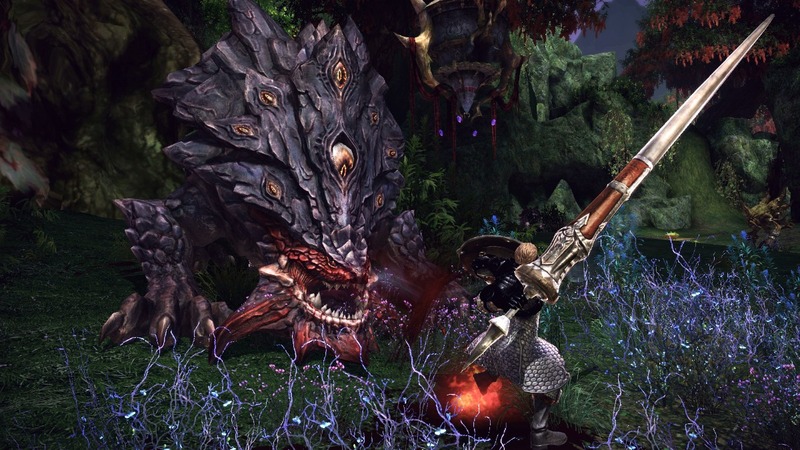 The demo featured mid-level characters (about level 35) in the Pora Elinu zone: a forest-themed region of perpetual night, full of magical creatures, fairy lights, and nasty monsters. All classes and almost all playable races (the child-like Elin were absent) were available for play. 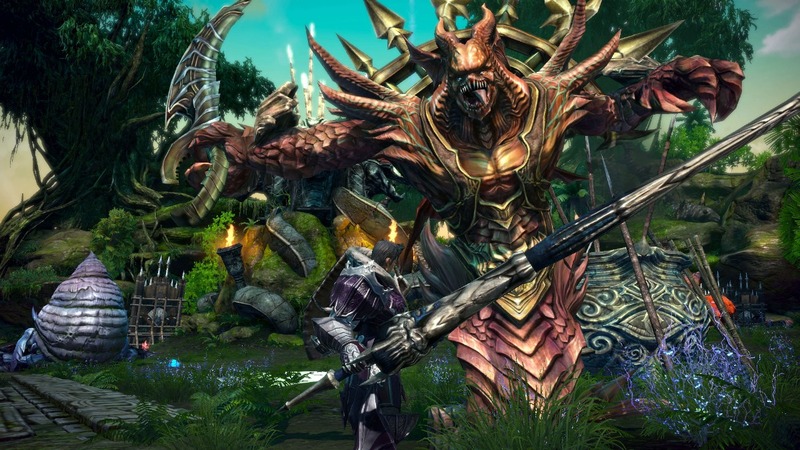 The demo gave its players a good feel for the combat and the roles of each class. 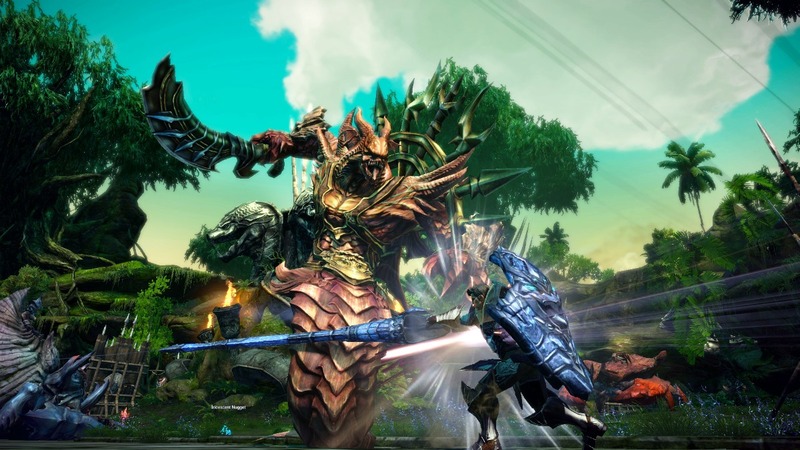 I was fortunate enough to jump on several different kiosks during E3 2011 and got some hands-on time with three of TERA‘s eight playable classes: the Warrior, Berserker, and Archer. Before describing my impressions, it is important to mention an interesting mechanic that all classes in TERA utilize: the combo system. 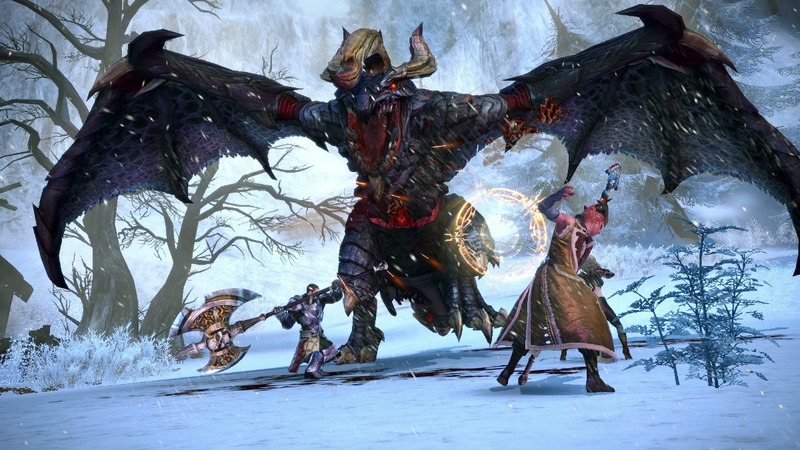 To make the action combat more streamlined, the game uses a combo system to make stringing attacks and skills much easier. Rather than cluttering the UI or keyboard with excess skills and information, the kiosks at E3 2011 had only a few skills mapped to the number keys (1-6), in addition to the standard attack (left click) and special attack (right click). Obviously there were more skills than what was immediately available, and the easiest way to access these skills was through the combo system. The combo system strings certain skills together with a press of the spacebar, so players don’t need to actively bind these skills onto their keyboard. These combos are triggered when certain conditions are met in combat. 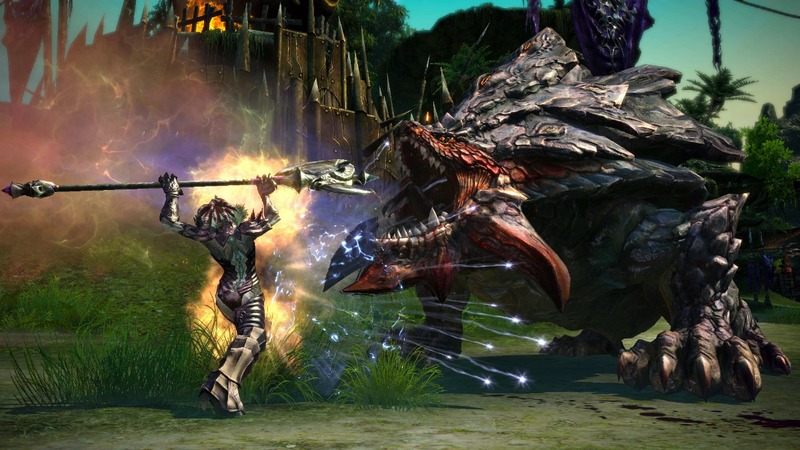 For example: the Berserker class has a variety of heavy blows that can knock down opponents. Upon a successful knockdown, an on-screen prompt will let players know that a combo can be initiated to capitalize on the downed enemy. Pressing the spacebar will trigger the combo, and the Berserker will use a thrusting skill, leaping into the air and impaling downed enemies with his massive axe. Another good example can be witnessed when the player is knocked down: a combo prompt will allow them to use their riposte to recover their balance and counterattack. With that said, onto the classes! 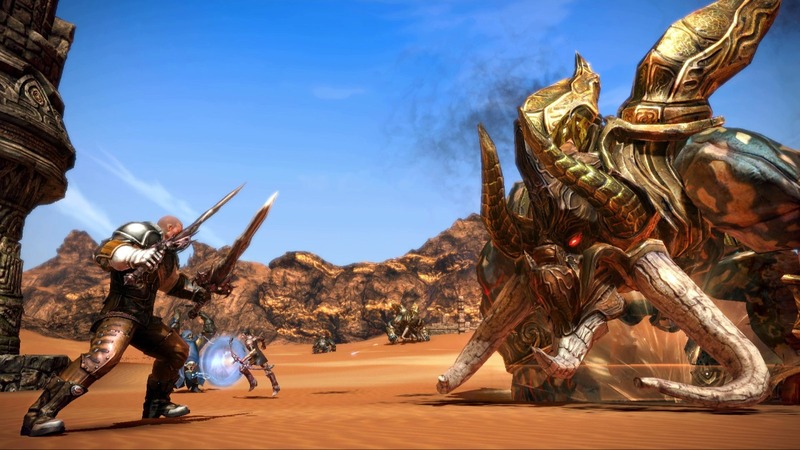 The dual-sword-wielding Warrior class has plenty of flashy attacks and combos. Despite their DPS appearance, however, they are a tank class. They excel at keeping enemies focused on them, and their evasive ability allows them to avoid taking damage by jumping away from or over an incoming attack. The Warrior class feels very much like the speedy protagonist you would control in a console action title. They have great attack speed, and can cancel some of their attacks and skills into a dodge if the situation calls for it. Unlike said protagonists however, a Warrior’s evasive ability suffers from a rather severe cool-down. Dodging requires 4-5 seconds of recovery time before it can be used again, which makes avoiding damage extremely difficult when players are faced with several enemies. Players can still move around and fight, but dodging is the Warrior’s only sure-fire way to avoid taking damage, which is crucial to staying alive as a tank. This handicap is made all the more apparent when compared to the Berserker, who can enter a defensive stance whenever they wish. Perhaps the Crystal Augment system will offer an option for shorter recovery between dodges? The Warrior class is currently undergoing some tweaks in the Korean version of the game, where it is believed that their DPS capabilities are being improved. Exactly what those tweaks are, En Masse Entertainment couldn’t say for sure (as much as I asked). This melee category, wielding a massive axe and decked-out in heavy armor, is a DPS class at heart. Action games usually feature a slow and heavy, but absurdly powerful weapon that players can master: Ninja Gaiden had the War Hammer and Dabilahro, Devil May Cry always features its gauntlet weapons, and God of War had the Barbarian Hammer and Nemean Cestus. 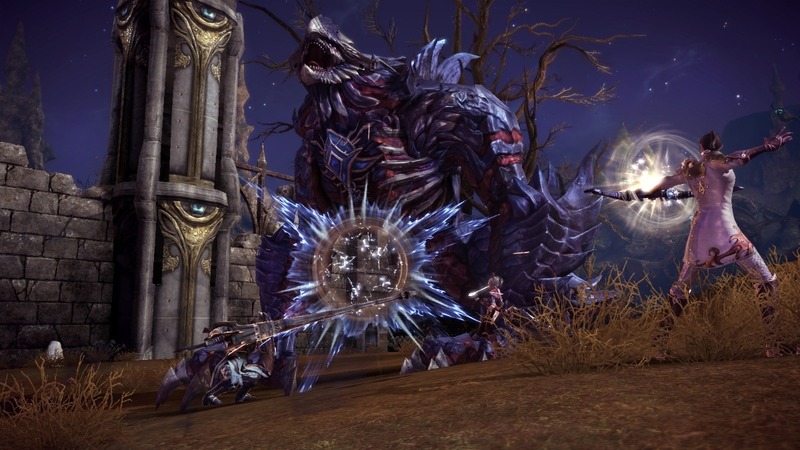 TERA‘s Berserker class is very much in-line with these slow-yet-powerful playstyles. Berserkers do not have any evasive ability aside from running out of the way. Instead, Berserkers can block by hold their axe out in front of them to deflecting incoming attacks. Berserker uses much heavier blows than Warriors, and as such they cannot cancel into a defensive stance as effectively. Nonetheless, their block is extremely good at reducing damage, or negating it altogether. Berserkers are also adept at knocking down enemies. In fact, DPS and crowd control are what the Berserker class excels at; many of their attacks are designed to either down opponents, or deal heavy damage to a group of enemies. Their most basic skill is a charged spin attack, which can catch a single enemy or a crowd of enemies in a whirlwind of damaging blows. When fully charged, this attack alone is strong enough to heavily damage or outright kill most fodder enemies. Another basic Berserker skill is a heavy chop attack. While not particularly flashy, this attack has a high chance of knocking the target on its rump, opening them up to more punishment from the Berserker or from his/her allies. As their name implies, Archers are a projectile-heavy DPS class. Their primary means of dealing damage are the magical bolts they fire from their bow, making them excellent mid-range fighters. They do come armed with a few close-ranged skills, perfect for when their enemies get too close. It is the projectile classes like the Archer that accentuate TERA’s unique combat system. Because of the aiming mechanic Archers and long-range classes utilize, the gameplay steps away from the console action game feel of the previous two classes and jumps into the shooting genre. Players who are familiar with first-person or third-person shooters will feel most at home with the Archer’s fighting mechanics. The aiming reticle that all classes utilize is less vital to melee classes because they fight at close range: quite simply, they don’t have to aim as precisely. This is not so with Archers. Players must align their targeting reticle constantly to connect with their shots and skills. Due of their range advantage, one would thing that projectile-heavy classes would have a significant advantage over melee classes, especially in the hands of a skilled player. However, the magical bolts fired by Archers have a limited range, forcing them to stay relatively close to their target. Archers can fight out-of-range of most melee attacks, but a quick dash from a melee opponent can change the situation very quickly. Archers can defend themselves with a back-step, which allows them to leap back and avoid incoming damage. It has a lengthy recovery time (much like the Warrior’s dodge) but unlike Warriors, they can only evade in one direction: backwards. Still, the evasive ability is extremely useful, and when coupled with the range advantage, a skilled Archer can easily avoid taking unnecessary damage, making them a great party ally or a nasty PvP opponent.